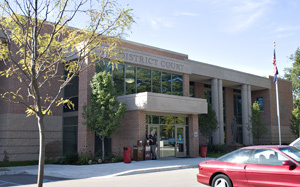 PROJECT: 47th District Court of Michigan, Plan and Program, Farmington, Michigan. 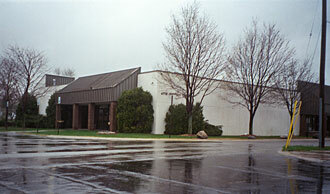 47th District Courthouse, Farmington, Michigan, in former school building, 1999. 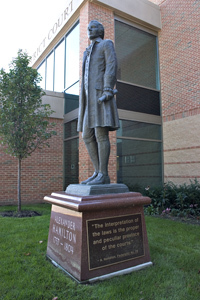 New 47th District Courthouse, Farmington Hills, MI, 2004, reclaimed statue of Alexander Hamilton The 47th District Court, one of several in Oakland County, near Detroit, was housed in a one-time elementary school building, severely limited in total area and lacking appropriate security and privacy. We studied two improvement options: a new facility on the city government complex in Farmington Hills and renovation and expansion on site, developed an objective assessment of facility space needs, used that to prepare a space needs program, and analyzed the extent, feasibility, and cost of that program for each option. SCOPE OF SERVICES: LSC studied and analyzed the operations of the court, assessed its facility needs, and prepared a complete facility space program for each option. We interviewed all key court employees in each department, observed procedures, and collected data about their space needs. We briefed court personnel and members of the two city councils on the results of the study and worked with the design architect to prepare pre-design space use plans and to recommend they choose the new facility option, which is now going ahead. The new courthouse opened in 2004 and is proving to be exemplary both in function and form. The interiors are spacious, secure, and effective; the exterior is extraordinarily impressive - overall the building well conveys an appropriate image of justice. RESPONSIBILITIES: Carried out the above services as consultant to the design and project architects.